Without primetime sports coverage, there would be little need for sports technology, and without Roone Arledge, there would be no primetime sports coverage. Life magazine named him one of the 100 most important Americans of the 20th century, but in the sports world, Arledge is in the top 10. Roone Pinckney Arledge Jr. crafted the modern link between sports and entertainment, transforming ABC Sports from a financial disaster to the world’s go-to destination for athletics entertainment. As vice president from 1960 to ’68 and president from ’68 to ’86, Arledge moved sporting events from weekend programming to primetime television, using unheard-of technical innovations to make the Olympics some of the most important programming on television and creating a staple of modern American sports, Monday Night Football. One year after joining ABC, Arledge created ABC’s Wide World of Sports, which became the most successful sports program of all time. 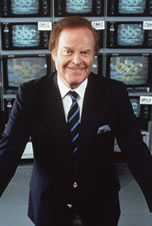 The show covered every event imaginable, from baseball to luge, and made announcer Jim McKay’s voice as common a household fixture as his keystone phrases “spanning the globe” and “the thrill of victory and the agony of defeat.” Arledge was one of the first producers to bring live international events to an American audience via the Atlantic satellite, but that was only the beginning. Introducing such techniques as slow motion, freeze frame, instant replay and split screen, Arledge turned sporting events into dramas. He added “up close and personal” athlete features to complement the games, transforming once obscure international athletes into instant celebrities. He made primetime sports into much more than a recording of the game, turning sports programming into its own main event. In 1970, he created Monday Night Football and, with it, a new national pastime. Arledge had to fight to sell affiliates and advertisers on the idea of primetime football, but he believed in his vision of sports as entertainment. The step into primetime also paved the way for other sports. In 1971, one game of the baseball World Series tested the primetime waters, and a few seasons later, all World Series games were cashing in on primetime viewership and advertising revenue that did not exist before Arledge recognized their potential. The producer of 10 Olympic Games, he won one of his 32 Emmy Awards for his coverage of 1972 Munich Games, was inducted into the Olympic Hall of Fame, and was the first television executive to receive the Medal of Olympic Order. (c) American Broadcasting Companies, Inc.